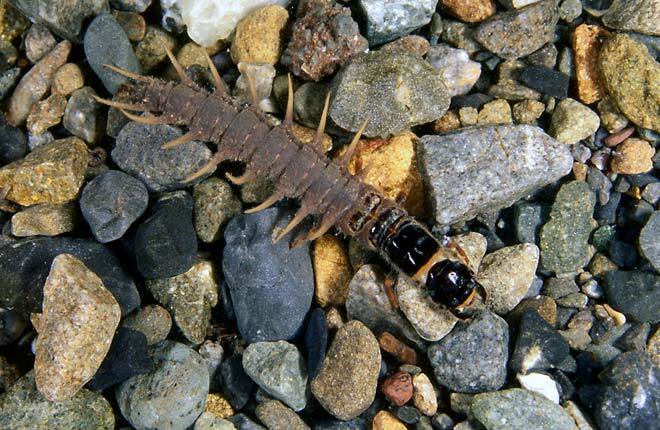 The toebiter (Archichauliodes diversus), also known as a dobsonfly or creeper, is New Zealand’s largest stream insect. It looks a bit like a centipede. The term ‘toebiter’ refers to the pincer-like powerful jaws. The larvae are typically 25 millimetres long and prefer the water of stony streams and rivers. They take several years to mature, during which time they prey on mayfly larvae. Toebiters are sometimes used as bait by young people hoping to catch trout.